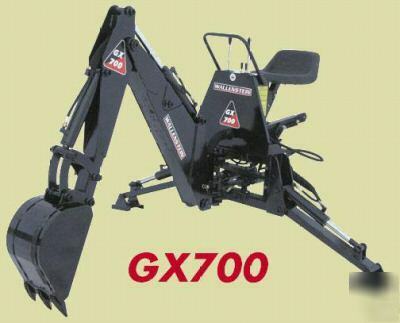 Brand New Wallenstein Model GX700 Skidsteer Mounted Backhoe. This is a Great Backhoe for 30-60 HP Tractors. * Transport Weight - 900 lbs. * Digging Depth (2 ft flat bottom) - 7 ft.
* Overall Operating height - 8.5 ft.
* Reach from Swing Post - 10 ft.
* Dipper Boom Digging Force - 1300 lbs. * Bucket Digging Force - 2600 lbs. * Boom Lift Capacity Appr. - 800 lbs. * Main Boom Cylinder Diameter - 2.5"